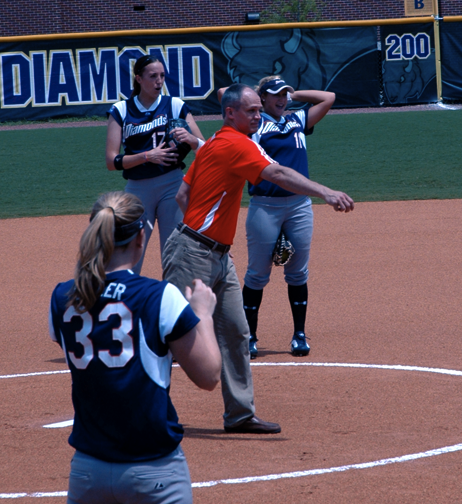 Dr. Damon Petty throws 1st pitch at Tennessee Diamonds softball game. Diamonds star pitcher, Monica Abbott, and first base/pitcher, Megan Gibson, liked what they saw when Dr. Petty threw out the first pitch at their game against the Chicago Bandits on July 18, 2010. Dr. Petty was relieved to throw a strike. "I didn't care if it hit the press box. I was going to throw it hard," he said afterward. 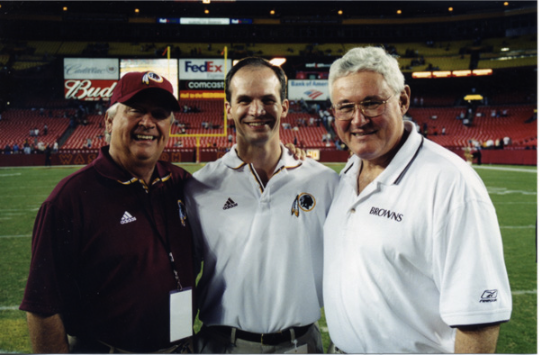 From left: Dr. James Andrews, Dr. Damon Petty and Dr. John Bergfeld at a Cleveland Browns versus Washington Redskins football game. Dr. Andrews was the team physician for the Redskins and Dr. Bergfeld was team physician for the Browns. Dr. Petty was the assistant team physician for the Redskins during his Fellowship with Dr. Andrews in 2002. Dr. Bergfeld was Dr. Petty's mentor while he was a resident at the Cleveland Clinic, where he assisted Dr. Bergfeld with the Browns.